Notes: Ardglass Castle (also known as The Newark) is situated in Ardglass, County Down, Northern Ireland. It was originally a row of 15th century warehouses by the harbour. Large sections of the original building can still be seen within the modern club house of Ardglass Golf Club. (Grid ref: 561 371) The 15th century structures were converted into a castellated house at the end of the 18th century by Charles FitzGerald, the first and last Baron Lecale. The castle was also lived in by his mother, Emily FitzGerald, Duchess of Leinster, and her second husband, William Ogilvie, who had been tutor to her son, Lord Edward FitzGerald. Ogilvie subsequently worked to develop Ardglass as a fashionable seaside resort and port. The old warehouses were given battlements, regular windows and the interior was decorated with plasterwork of the period. It was eventually inherited by William Ogilvie's daughter by a former marriage, who was the wife of Charles Beauclerk, a great grandson of Charles Beauclerk, 1st Duke of St Albans. In the later 19th century there was further work on the windows and a porch added to one front. 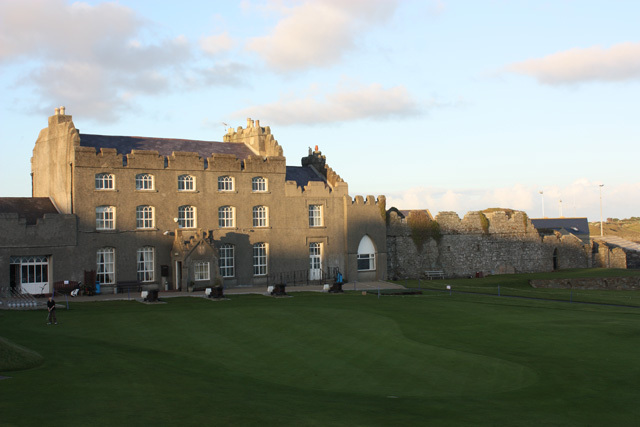 The castle became the premises of Ardglass Golf Club in 1911.